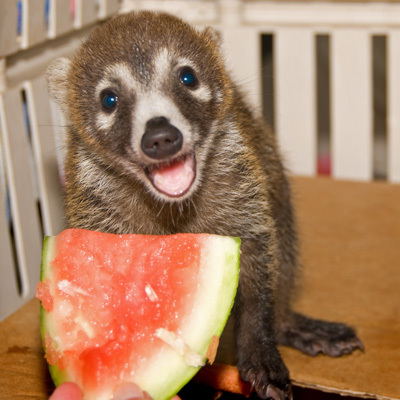 In the summer of 2009, Southwest Wildlife got a call about a baby white-nosed coati found on a roof in Apache Junction, Arizona. A volunteer was sent out to pick up the little one. That first afternoon, we estimated that she was around 6 weeks old; young enough that if she was with her mother, she would still have been nursing. Her teeth were brand new and really tiny. She was ravenously hungry and thirsty, but had no clue how to go about drinking or licking up food from a dish. She refused formula from a syringe, tasted broccoli, and even tried some hard-boiled egg, but nothing seemed to satisfy her. Finally, watermelon solved the problem! She knew just how to slurp it up. In fact, she couldn’t get enough! Finally, her tummy satisfied, she hung on the crate door, pressed her now-round belly against the bars, and reached out with a little paw. It was pretty obvious that she’d been handled by people and was looking for a little comfort. If you’d scratch her belly, she’d close her eyes, bury her face behind her arms and smack her mouth. She’d immediately fall asleep and wake herself up by falling off the door. It was a shame she wasn’t with her mother. Because she was so friendly with people, we knew she’d never be releasable. We named her Peanut. 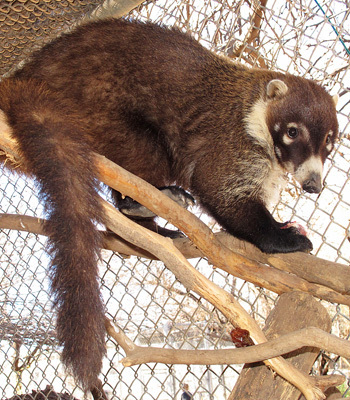 These days, Peanut is all grown up and living with a group of coatis. Some of her roommates are native white-nosed coatis, like herself, and others are South American coatis, mostly former illegal pets that came to us after being confiscated by Arizona Game and Fish. Peanut reminds us that wildlife belongs in the wild. Please contact Southwest Wildlife or a wildlife rehabilitator in your area as soon as possible if you ever come across a young wild animal. When you sponsor Peanut you are also helping us educate about the need for wild animals to be wild.